Charles W. Chesnutt is widely considered to have been first major black American novelist. He was certainly the first to have his fiction regularly published by national magazines, particularly The Atlantic Monthly, where his stories began appearing in 1887. After the turn of the century, Chesnutt found it increasingly unlikely to support his family on a writer’s income. Plus, as tastes changed, more of his stories were rejected by publishers. One of the unpublished stories, “White Weeds,” is in many ways unlike anything he’d written before; in tone and plotting it resembles a crime mystery or a Gothic tale. 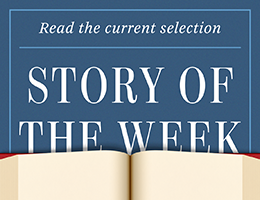 This remarkable story, about a white couple whose marriage is destroyed by an unsubstantiated rumor and an unhealthy obsession, was recovered from among his papers and first published in 1974, and we present it as our Story of the Week selection.